We tried to look at the importance of freshness from a scientific angle a couple weeks back, and though there were perhaps a couple missteps, it's clear that the people making the beer find freshness to be very important. Listen to Collin McDonnell of Hen House Brewing, who we talked to about freshness: "Beer is perishable and nine out of ten beers are getting worse the longer they stay in the bottle -- hoppy beers in particular lose a significant amount of aroma and start oxidizing (tasting like cardboard or cooking sherry) in a short period of time." It could really be that simple. Like all the rest of the things we drink and eat, there's a Best By attached to beer, and as vigilant beer consumers, we should stay on top of it. So how can we spot fresh beer, and the best places to buy the freshest beer? 1) Look at the bottle. Letters from A-M represent the month of the year. The next four digits are the day and year the beer was first brewed, and the last two letters are the state code where it was brewed. But this won't work for all packaging codes, like, for example, Sierra Nevada and Lagunitas. "Packaging codes are intentionally unreadable. Beer with no freshness dating except a packaging code leaves you with few options; you can weigh how fast that beer moves at that retailer and how close the brewery is to where you're buying it and extrapolate a guesstimate of freshness, but the better option to to buy something you know is fresh," says McDonnell. ""Enjoy by" dates are better than nothing, but they can be deceptive. Just cause a beer can stay for six months in optimal conditions doesn't mean it got those optimal conditions. Six months is a long time to be sitting in a warehouse, moved around on trucks, and waiting to be picked up on a shelf. The longer a beer is not consumed, the more likely it is that it gets warmed up or exposed to sunlight or otherwise spoiled." 2) Look at the temperature. We know from last week's look at the science of freshness that temperature is the main accelerant for the death of hops. McDonnell is adamant: "don't buy IPA off a warm shelf." Of course, the higher-alcohol beers from other styles can do well, but even a pils on a warm shelf will lose freshness quickly. 3) Look at the light. We also know from last week beers get more sulfurous when they are hit by the light. So look for beer in dark places. Even if your beer bottle is brown -- "brown glass and a six pack carrier does a fairly good job of protecting beer from light," McDonnell admits -- you'll want to avoid beer that's too close to the window ("anything sitting in direct sunlight is going to be skunky and gross."). The picture in the header is from a BevMo in Menlo Park, California. See how many rules that particular store is breaking? Your local grocer may not have quite the extensive collection of beer, but that beer is either cold in the cold beer aisle, or it's been cold in the cold storage in back, and there's very little likelihood it's been sitting in the window. Consider getting your beer where you get your other perishable food items! In his speech at Almanac's Beer Talks at SF Beer Week, McDonnell pointed out that freshness can be the source of community -- where is beer fresher than your local brewpub? Go get your beer at the source. "90% of Americans live within 15 miles of a brewery, so go meet your locals and buy six packs from them," says McConnell. It's hard to argue with a beer that never had to sit anywhere but in that dark cool brewery. There's some death at the end there, but it's also important to note that we're only 60 days in. And that we're dealing with 10-20 raters a day at the end. 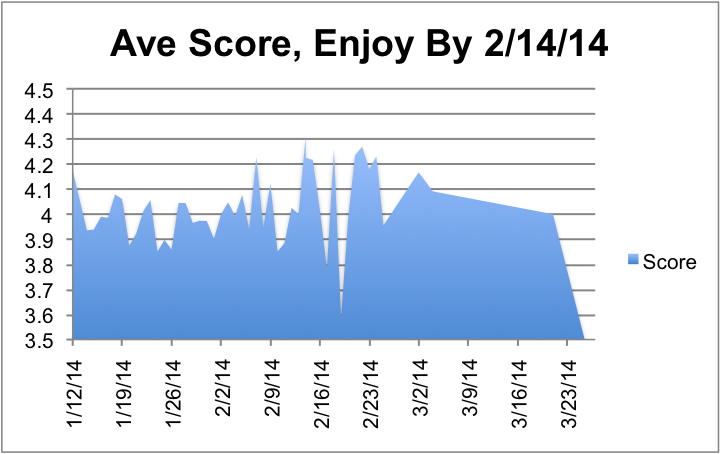 We have 200-400 ratings a day before 2/14/14, and then the sample drops by 90%. Does Stone do a good job of keeping their beer fresh in their supply chains, and get their Enjoy Bys in fridges, or does the consumer not care as much as the brewers would like to think? Perhaps you can do your own experiment. Leave one of your IPAs out of the sixer next time. Leave it in the dark, in the beer fridge, if you like. It's your experiment -- but remember that if you leave it out in the sun, it most certainly won't be any good next week let alone next month. Try the beer, see what you think. If you find freshness important, then act on it. "You're buying beer because you want to enjoy it, so make sure you're getting the most for your money," says McConnell. If you think your beer store keeps the beer cold and dark, let people know. If they don't let them know -- with your dollar or your voice or both -- that you'd rather they did care about freshness like you do. There's a freshness movement gathering, perhaps spurred into the public consciousness by Stone's Enjoy By, and the consumer can use this moment to advocate on the behalf of their beer. Don't we deserve, cold fresh beer?